I worked on the same projects yesterday as I did on Saturday, so it's a little bit of a deja vu here. 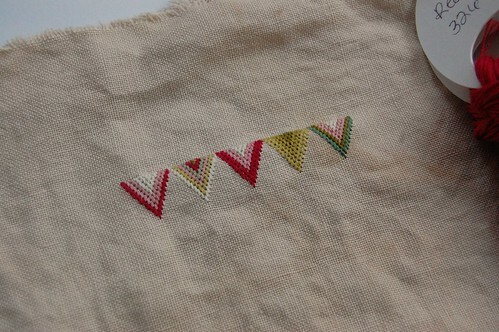 :) I got a some more triangles stitched on Ruthie. I'm loving this one! It was hard for me to put it away. And here is my progress on HoHRH. I would really like to get this block finished soon!! Woo! Great progress, Nicole. Both are beautiful! Can't wait to see your KFL progress today. Ruth Bachelor seems to be a very cheerful project with all these lively colours. I can see why you love to stitch on it. Great progress on the Houses. 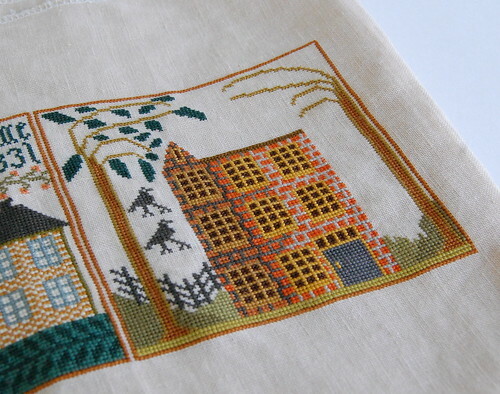 I love the block you are stitching on right now. You are making fantastic progress! Both pieces are looking just fantastic! You're making great progress on both of these. The more I see of Ruthie, I wish I had started her. And I can't wait to see your progress of KFL. Looks wonderful -- both of them! Houses can definitely be slow going but it's so worth the effort! Ruthie is fun to stitch too, isn't she? Love them triangles! lol! Great progress, Nicole. You and Paulett and Margaret are sorely tempting me with Ruthie! 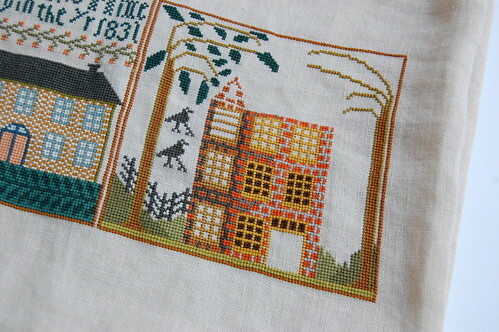 Your HoHRH is looking great and I can't wait to see KFL - a gorgeous sampler! Great progress on both projects Nicole! Your making great progress on both your projects. 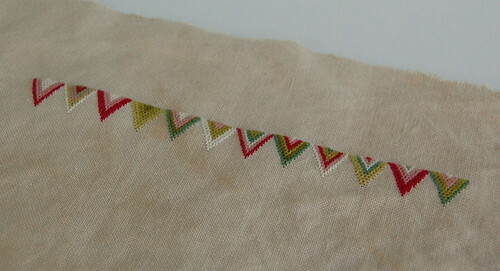 I'm loving stitching on Ruthie too... the bright colors cheer up our gloomy winter weather. Great progress. The more I see HoHRH, I'm feeling an urge to stitch it. You are making progress. That Ruthie is starting to grow on me. Wow!! Those colors are just amazing!!!! Nice progress on HoHRH, and Ruth! You have such fast needles! Have a great day, Nicole. Very nice! Ruthie looks great. As soon as the sun come out this morning I am going to take a picture of mine. Your VoHRH is really coming along too. Love the colors on "Ruthie!"